Amatrol’s Portable Electric Relay Control Troubleshooting Learning System (990-EC1F) covers concepts widely used in industrial, commercial, and residential applications to regulate electric motors and fluid power actuators, as well methods used for troubleshooting problems in relay control components and systems. This portable learning system offers customers flexibility and convenience when there’s a need to use a trainer in multiple locations or where space is too small for a full-size trainer. Portable Electric Relay Control Troubleshooting includes a relay control panel with pre-mounted electrical control, pneumatic, and electric power components. Learners can use these components to connect electrical terminals to heavy-duty banana jacks to test various automation control circuits. This system also includes a digital multi-meter that will be used for troubleshooting concepts and skills. Combined with Amatrol’s world-class interactive multimedia curriculum, this innovated product can provide learners with a thorough understanding of electric relay control. Real-World Troubleshooting using Electronic Fault Insertion! Portable electric relay control troubleshooting uses FaultPro, an electronic fault insertion system that is only available from Amatrol, to insert faults into the system for troubleshooting. During the learning process, FaultPro allows learners to insert faults in the system as they progress through the step-by-step procedures learning industrial troubleshooting methods. Then, FaultPro can be set to randomly select and insert a fault to test a learner’s troubleshooting abilities and prepare them to solve real-world technical problems once they’re in the field. This system allows learners to use a digital multimeter to perform troubleshooting skills like: testing input and output devices, relays, and relay logic circuits. Amatrol offers a full array of electric relay control troubleshooting training in a portable learning system, where learners only need desk space for the trainer and a computer to study this vital industry skill. An electrical relay, most often used as a memory logic element, is the component that makes electrical relay control possible. Learners will study applications of this vital component, as well as the available styles of control relays, the major components, and their ladder diagram symbols. Engaging Interactive Relay Control Curriculum Covers Logic Elements, Timer Relays, and Much More! Amatrol offers extensive, thorough multimedia curriculum covering electric relay control basics and troubleshooting such as the six logic elements of control logic and more advanced topics like a timer relay’s operation within an unloaded motor start circuit. Learners can then apply this theoretical knowledge to immediate hands-on skills. For example, learners study how multiple cylinders can be controlled by limit switches and then immediately operate a dual cylinder control circuit using two limit switches. This multimedia curriculum is highly engaging and features text, audio voiceovers, 3D animations, videos, and interactive exercises and quizzes. 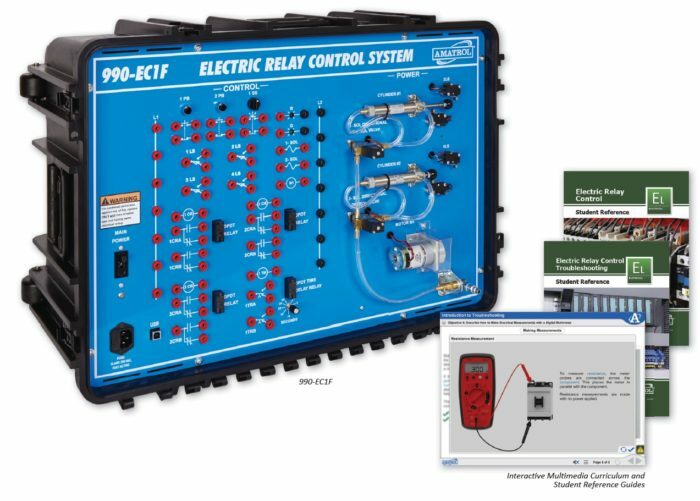 Sample copies of Electric Relay Control and Electric Relay Control Troubleshooting Student Reference Guides are also included with the system for your evaluation. Student Reference Guides supplement this course by providing a condensed, inexpensive reference tool that learners will find invaluable once they finish their training, making it the perfect course takeaway.